This tier list focuses on individual units. 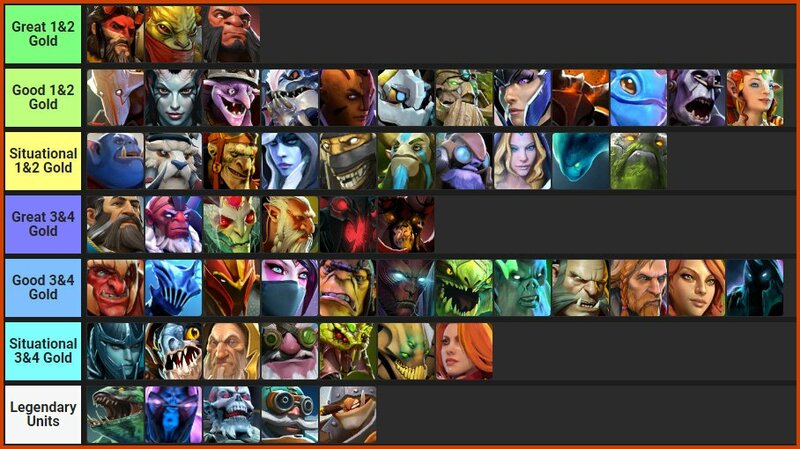 If you want something more advanced, you can check out our Auto Chess Strategies Tier List! The unit scores and tiers in this article were taken from a poll among high-tier Auto Chess players taken on the 28th of January and organized by Questica. You can see the original Reddit thread here. Since then, the tier list has been updated based on patch changes and high-rank player opinions. To make the tier list a bit more useful, we would divide the units based on their cost in three divisions – Early (1 & 2 gold), Mid (3 & 4 gold), and Late (5 gold). The reason is that it doesn’t make a lot of sense to compare a 1 cost unit to a 5 cost unit – you simply wouldn’t encounter the latter in the early/mid game. Consequently, you’d need to build your strategy from lower-cost units. The best units out of the division are usually good enough even on their own (synergies are great, of course, but they would still be useful without them). The other units need to be used in synergy strats. The worst units should be avoided unless you are going all-in on a synergy. Good stats and ability. The reason he is great is his huge AoE nuke, which keeps him relevant in the mid-late game unlike most other cheap units. Good enough to buy without a lot of synergies, although having at least another Orc is recommended in the early game. Going for the max Orc synergy is a viable way to build a very tanky frontline. Only 1 gold, yet deals very high single target damage. The cheapest way to snipe glass-cannons like most mages before they destroy your army and fits a Goblin early-mid game strat beautifully. Great starting unit and great tribals. He is very tanky and provides decent crowd control (might prevent some units from using their abilities right away). Yet, he deals very little damage, so make sure you have DPS covered with other units. Both his Class and Species is easy to utilize in the early game. Bounty is the best single target cheap Assassin. QoP is the best AoE cheap Assassin. Place her close to your frontline - she will deal more damage if she uses her ultimate on the enemy frontline, rather than their backline. The main source of AoE damage for Warrior strategies. Falls off in the late game, but still great if you manage to get the max Orc synergy. The third best unit in the game (according to the original poll) costs 2 gold! Timber is an amazing tank but unlike most other tanks deals very high damage thanks to his low CD AoE nuke as well. Great in Mech/Goblin strats, but good enough to buy even without these synergies. Some of the best raw stats in the game combined with a very low CD ability. Needless to say, he synergizes with physical damage dealers (pretty much everything except some Mages/Warlocks/Shamans). Moreover, the Naga synergy bonus is extremely valuable even with only two Nagas, which makes him useful in a lot of strategies and a super versatile unit. Good damage dealer, but relatively squishy. Make sure you have other elves to unlock the evasion bonus to help him stay alive. Try to position him in a way that allows him not to tank too many units. The mana burn is useful if he manages to get on top of a unit with a useful ability (great if he manages to get on top of the enemy backlines, bad if he's fighting the frontline tanks). Great cheap tank for Goblin/Mech synergies. Sell later on unless you are going for (6) Goblins. One of the best early-game tanks. Unlike Timber, who is offensive, Treant provides great sustain for your army. He's easy to upgrade thanks to the Druid synergy, but to be worthwhile in the late game you might want to have other Elves as well -his high HP pool and the Elves evasion makes him extremely hard to kill with attacks. A great damage dealer in an Elf or Knight strat. Make sure to give her damage items, otherwise, her damage output wouldn't be sufficiently impactful. Good damage dealer and tank in a Knight or Demon/Demon hunter strategy. Make sure he is your only demon (or that you have Demon Hunters). Often sold mid-late for more powerful demons (SF, Doom) unless you have him on a very high level. Decent AoE damage dealer but nothing too impressive. He's mainly used in Dragon synergies (Puck + Viper + DK). Could also work in Mage synergies. Decent source of control. Stats are bad, but both the Troll and the Warlock synergies are some of the strongest for the late game, so get him if you plan to go for either (otherwise don't). Great source of sustain and decent damage in the early game. Could be used even outside Druid strats – she’s an easy way to get the Beast synergy. However, she falls off in the mid-late game hard because her heal doesn't scale very well. If you have a three-star Ench (which is not hard to do because she is a Druid), try to give her some DPS items to keep her relevant - she has a decent attack speed and attack animation. Too little damage for a backline damage dealer. This means it's actually a good decision to use him on the frontlines - he will get his abilities off faster and thanks to the Goblin/Mech synergy he'll stay alive for long enough. Don't use him outside Goblin/Mech. Bloodlust is not as good as it sounds – the likelihood to cast it on the right target (right-click damage dealer) is low. That being said, his stats are great and he is a powerhouse in the early-mid game. An easy way to get the Beast synergy for Warrior strats. Strong early on, falls off in the mid-late game. Napalm is underwhelming. Stats are not impressive. However, he is needed for the full Troll synergy in the mid-late game. It's easiest to play him early-mid in a Knight strat. Simply too low DPS for a squishy ranged damage dealer. Only get her for the Undead Synergy (very easy to get with an Abaddon in a knight opening strat) or if you intend to go for Hunters (which is usually risky). Terrible stats - putting him in your army too early could cost you games. That being said, he is a part of the 4-Troll synergy and the 2-Shaman synergy. Both synergies are great, so if you intend to go for them keep him on the bench until you are ready with your other trolls (and Disruptor, the other Shaman). Summons are powerful in the early game when there is little strong AoE. In the late game he falls-off hard. Get him in Druid/Elf synergies, otherwise skip. You might even want to sell him off after you max your lone Druid. Like all units with summons, he is great for punishing your opponents if you are already winning. Underwhelming stats for an assassin - one of the slowest attacks in Dota Auto Chess. Waveform could be hit or miss depending on how the enemy units are clumped up. Avoid him unless you need him for the 6 Assassins bonus. Terrible stats, terrible ability that could backfire. Only get him for the 9 warriors synergy, otherwise, he’s the worst unit in the game. Terrible stats – squishy and no damage. The ability is the selling point, but it’s useful only when you have a lot of spellcasters in your army. She can shine if she allows your Tidehunter/Kunkka/Doom/Medusa to get off their abilities before your opponent's CC, but you don’t want to include her in the army early-mid because she is guaranteed to lose you rounds. Keep her on the bench if you plan to use her in the late game. Very hard to kill, but deals low damage for an Assassin, which somewhat defeats the purpose. While he's hidden, your opponents will focus your other units, which is not great. Don't buy him outside Assassin strategies. If you have an Assassin comp, however, upgrading your Slark as much as possible is a great idea because the Assassin synergy will boost his damage. A lvl2 or 3 Slark with crit is actually one of the strongest units in the game. His species is also great because it makes it easy to get at least the 2 Naga bonus, which is valuable in the late game. It's hard to put Mars in a tier list because he has a very specific tribal - Gods. It is quite powerful (reduced CD of all your heroes), but requires you not to build all your lineup with it in mind - you cannot have other species synergies (which includes things like (2) Humans, (2) Undead, etc. It's potentially powerful but generally hard to build. The most strategy-defining units, pick them with care. Many are great on their own, but don't forget synergies (don't get too many unrelated strong units) or you'll struggle in the late game. One of the best AoE control (and decent damage) abilities in the game in a unit with good stats. Literally no drawbacks. The Species and Class are good, but the AoE control is important enough in the late game to justify a Kunkka even with 0 synergies. His ability is very powerful in the mid and late game. It's a good idea to put him in the frontlines to help him get it off as fast as possible (if he casts it first, this will prevent your opponents from using their abilities in time). Works well with the 4 Troll start because of the Shaman synergy. The max orc synergy also shouldn't be underestimated. Great CC ability, not only controls but amplifies the damage enemies take. The 2-naga bonus is also amazing in the late game and very easy to get. This in itself makes her a very valuable unit. The Bear summon is extremely powerful - stronger in a fight than most other units in the game thanks to Entangle and a very good tank. Easy to upgrade thanks to the Druid synergy. Arguably, it's worth keeping an Ench, Treant, and NP on your bench simply to upgrade Lone Druid and then to sell the other druids off. To get him to lvl3 you need 4 Lone Druids, which is 5 less than any other non-druid unit. Arguably the best non-legendary source of AoE damage. If he’s the only demon you have, also a great source of right-clicking damage. Being a Demon makes him a very versatile unit - you can throw him in the backlines of any strategy. The warlock synergy is also great in the late game. Great stats (even better if he's your only Demon). His ability pretty much takes a unit out of the game – if it’s an important unit that hasn't cast its ability, that’s extremely impactful. Arguably the best single target damage dealer in the game. Give him damage items and ideally the Troll synergy (even 2 Trolls is decent, 4 is ideal) and he will go on a rampage. The main damage dealer in a Warrior comp. 6 Warriors 4 Trolls is probably the easiest strategy to get consistent wins with. The main mid-game unit and source of AoE damage and a must in Mage strategies. Could be useful in other compositions as well, but his Species is not impressive and usually makes it hard to find a spot for him in non-mage strats. Try to get at least the 3-mage bonus to make him shine. Good tank with a powerful transformation ability, which also increases his DPS a great deal. He is great for all three synergies he has and is an integral part of a Knight or Dragon strat. Upgrading him, however, is vital (much, much better at lvl2 and 3), so if other people are going for him this could lose you the game, so plan for him carefully. Great DPS, but also very hard to kill thanks to her ability. Refraction makes her a great "distraction" for strong enemy units. She is best used in Elf or Assasin lineups, but she could be strong enough even on her own. Has great Tribals, and his ultimate makes him a great mixture of a DPS and Sustain unit. The damage of Powershot is great, but the AoE is very narrow, which means she wastes it very often when she fires it in the wrong direction and loses rounds because of it. That being said, she is one of the bestHunters, so if you want this (or the Elf) synergy you should go for her. She has good stats. Very good damage dealer if you manage to get him to transform. This is much easier to do with a two or three star Terror Blade - a lvl1 TB usually dies before he transforms, which makes him pretty useless. Try to make use of the Demon Hunter class synergy by combining him with other demons and Anti-Mage. An integral part of the Dragon synergy and a very decent unit if you're going for 6 Assassins. The ability is amazing against creep waves. It could also be great in normal PvP rounds, but it is a bit unreliable (could focus a unit that is about to die soon anyway). The summons and transformation are quite powerful. He is great for all three possible synergies, but try to combine two of the three to include him in the strategy. A good tank and sustain hero in the early game, but falls off in the mid and late game. Use him in Knight strats. Good tank but very low damage. Use him to get the Undead synergy in Knight strategies. Usually used in (6) Goblin strats or as a tank in Warlock lineups. Nothing too impressive - his ultimate makes him tanky and with some attack speed or damage items he can deal decent damage. Great single-target damage, but unimpressive outside of Assassin strategies (and great inside Assasins). She is squishy, but the Elf synergy could help. The ability deals very decent AoE damage. Put him in a corner to ensure that he hits as many units as possible (and for protection). His major problem is that he deals very little DPS, which means he generates his mana very slowly. Putting him on the front lines is not an option - he'll die before he casts his ability. The best solution is to combine him with Crystal Maiden in the late game in Mage Strast. The ability deals very high single target damage, but she wastes it on an unimportant target most of the time, which decreases the value terribly. Her stats are quite bad. That said, her Species is valuable - if you're building Mages, it's easy to get to (2) or (4) Humans and utilize the silence. Give her mana items if possible - it'll help her cast Laguna faster and Fiery Sould will increase her DPS. The summons are simply not good enough for the price – laughable when compared to e.g. Lone Druid. You usually want to use him for the powerful Warlock synergy and ideally combine him with at least another Beast, otherwise avoid him at all costs. Decent stats and a so-so ability (unreliable because he could choose a bad target and totally waste a lot of his potential and doesn't really deal much more damage than his auto-attacks). His species and class, sadly, are bad. He is only ok in Hunter strategies, which, in general, are quite weak. Good ability, but similarly to Windranger’s – very unreliable. Bad Stats. Get him only for the 6 Assassin's synergy and put him on the frontlines (if he's tanky enough) to guarantee that he will get his stun off earlier. Very squishy and overall bad stats (especially on one Star), but has a strong AoE ability that gives a lot of utility - silence and miss chance. This makes him good with items like Void Stone to help him cast it faster. The Satyr tribal conceals your Bench from opponents, which is an interesting mechanic on high-level play, but nothing game-breaking, which makes his tribals underwhelming. The best AoE control ability in the game, which makes him the most valuable unit in the late game. Almost impossible to dodge/waste. The Naga synergy is also useful. The ability has amazing damage potential and is relatively hard to waste because of the decent AoE. The Warlock synergy is very strong in the late game. Placement is key - he needs to cast it as fast as possible, but he's not really tanky so be careful not to get him instantly killed on the frontlines. Chain frost deals obscene amounts of damage in the late game A must in Mage strats, otherwise good if you lack enough damage. The undead syenrgy is also strong, but Lich himself doesn't benefit too much from the armor reduction. Great, hard to waste AoE damage with low CD. Sadly, the synergies aren’t amazing and Gyro works best in Mech strats. Benefits a lot from the Mage synergy. Use him on the frontlines to make sure he plants the mine as fast as possible. Great in Goblin/Mech strats. Zeus, understandably, is extremely valuable if you're going for a Gods build and not so much if you're not. He has very high damage potential, but it's unreliable. He is also the only hero who increases the damage you deal to the enemy courriers, which make him a win-more type of character - i.e. not that great if you're struggling. Thanks for reading! I hope you found the tier list useful! If interested, you can check out our Dota Auto Chess Strategy Guide and our Dota Auto Chess Positioning Guide! If you're interested in getting better at Dota as well, we urge you to check out the rest of our Dota 2 Guides website!